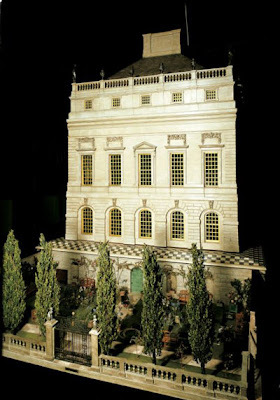 Queen Mary’s dolls’ house was dreamt up by her childhood friend and cousin of her husband, Princess Marie Louise of Schleswig-Holstein, the youngest daughter of Princess Helena and grand-daughter of Queen Victoria. After the annulment of her marriage, Marie Louise had returned to her family at Cumberland Lodge in Windsor Great Park and was in the custom of spending a great deal of time with George V and Queen Mary. It was during one of these visits, at Easter 1921, that she decided to commission a wonderful dolls’ house as a present for Queen Mary, who had an absolute passion for miniature objects. Being of an artistic and literary bent, Marie Louise immediately set to work floating the idea around her circle of arty friends, many of whom were amongst the best known artists of the age but her biggest coup was getting the wonderful architect Sir Edwin Lutyens on board after approaching him with her idea at the Royal Academy Summer Exhibition. Luckily for us all, Lutyens was not at all stuffy and was instantly enraptured by the idea which appealed immensely to his own childlike sense of fun (exemplified by his making the banisters of the crypt stairs at his never to be completed Liverpool Metropolitan Cathedral of Christ the King suitable for the choirboys to slide down them). Lutyens immediately and with great enthusiasm set to work drawing up plans for what was to be an elegant, harmonious and yet still very grand miniature house. He was aided in this by his friends, most notably the celebrated gardener Miss Gertrude Jekyll, who designed the small garden for the house, which a teeny birds nest, birds, a snail and colourful butterflies. The plans were also given an immense boost when Sir Herbert Morgan, President of the Society of Industrial Artists got involved, seeing in the dolls’ house an opportunity to show case British craftsmanship at the upcoming British Empire Exhibition at Wembley Park in 1924. His involvement ensured an even wider amount of external help and interest in the scheme and eventually a Committee was formed to formally oversee the project with Princess Marie Louise taking on the rôle of intermediary between the committee and Queen Mary, who was completely thrilled and excited by the whole thing. The house took around three years to put together, with the majority of its contents being custom made to a one inch to a foot scale. A team of around 1,500 craftsmen and artists worked on the building with most of the furnishings copied or at least inspired by originals in the royal collections and those at stately homes like Knole and Harewood House as well as scaled down copies of the royal dining services, paintings in the royal collections and so on. Everything was done with almost military precision as artists worked on the intricate ceiling designs, others carefully laid the marble, mother of pearl and wooden parquet floors and Lady Jekyll, Gertrude Jekyll’s sister-in-law, took charge of stocking up the miniature kitchen and larders with tiny provisions provided by companies like Frys, Tiptree jam and McVitie.